i) 56 > 26 because 5 > 2 and the denominator is the same. ii) 36 > 06 because 3 > 0 and the denominator is the same. iii) 16 < 66 because 6 > 1 and the denominator is the same. 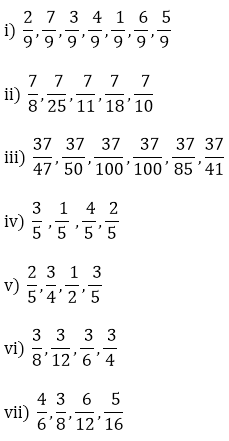 iv) 86 > 56 because 8 > 5 and the denominator is the same. i) 36 < 56 because 3 < 5 and the denominator is the same. ii) 45 > 05 because 4 > 0 and the denominator is the same. iii) 320 < 420 because 3 < 4 and the denominator is the same. iv) 17 < 14 because 7 > 4; if the numerator is the same, then the fraction that has smaller denominator is greater. i) 6/7 > 6/11 because if the numerator is the same, then the fraction with smaller denominator is greater. ii)  3/7 < 5/7 because 3 < 5 and the denominator is the same. v) 8/3 < 8/13 Because if the numerator is the same, then the fraction with smaller denominator is greater. HCF of 2 & 12 is 2. HCF of 3 & 15 is 3. Divide both the numerator & denominator by the HCF of 3 &15. HCF of 8 & 50 is 2. Divide both the numerator & denominator by the HCF of 8 & 50. HCF of 16 & 100 is 4. Divide both the numerator & denominator by the HCF of 16 & 100. HCF of 10 & 60 is 10. Divide both the numerator & denominator by the HCF of 10 & 60. HCF of 15 & 75 is 15. Divide both the numerator & denominator by the HCF of 15 & 75. HCF of 12 & 60 is 12. Divide both the numerator & denominator by the HCF of 12 & 60. HCF of 16 & 96 is 16. HCF of 12 & 75 is 3. Divide both the numerator & denominator by the HCF of 12 & 75. HCF of 12 & 72 is 12. HCF of 3 & 18 is 3. Divide both the numerator & denominator by the HCF of 3 & 18. HCF of 4 & 25 is 1. Isha read 25 pages of a book containing 100 pages. Nagma read 1/2 of the same book. Who read less? Now, compare 14 & 12. LCM of 4 & 2 is 4. Convert each fraction into equivalent fraction with 4 as its denominator. 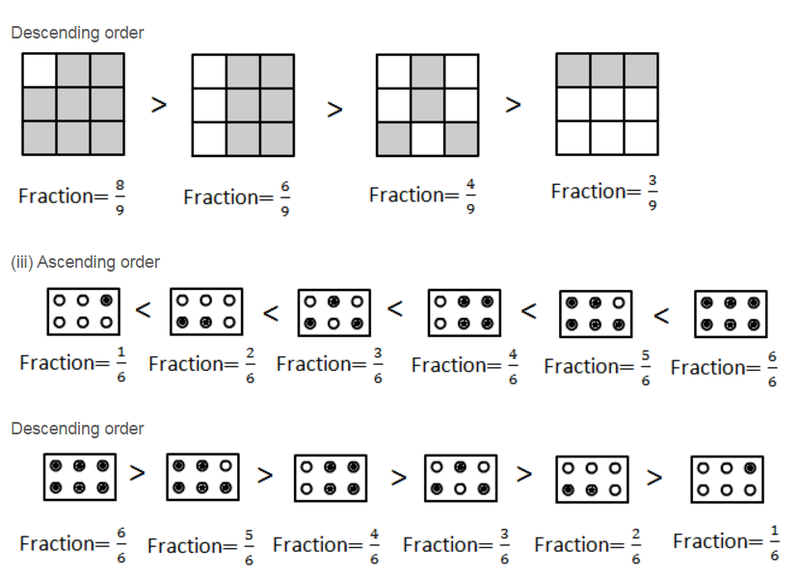 i) 2/9, 7/9, 3/9, 4/9, 1/9, 6/9, 5/9, when the denominators are the same and numerators are different, then the fraction with greater numerator has a larger value. 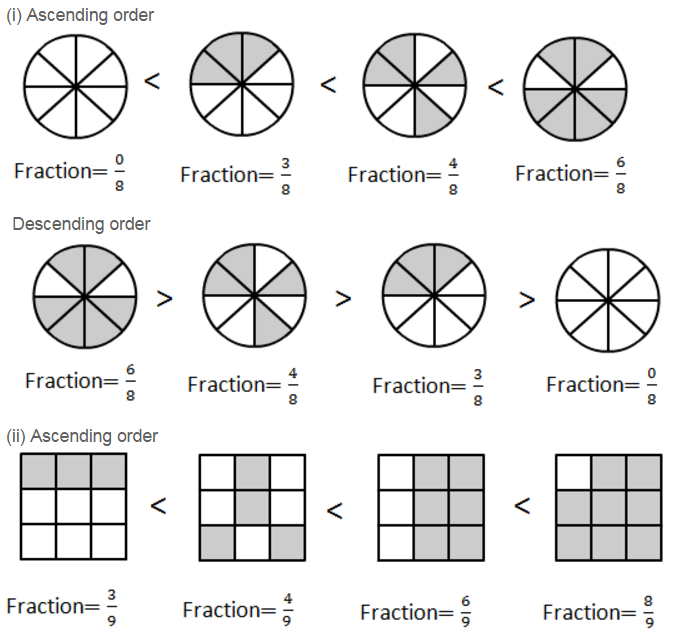 ii) 7/8, 7/25, 7/11, 7/18, 7/10, when numerator are the same and denominators are different, the fraction with greater denominator has a smaller value. When numerators are the same and denominator has a smaller value. When denominators are the same and numerators are different, then the fraction with greater numerator has a larger value. 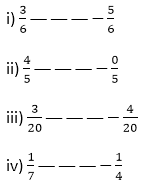 vi)  3/12, 3/8, 3/6, 3/4. Find answers to the following. 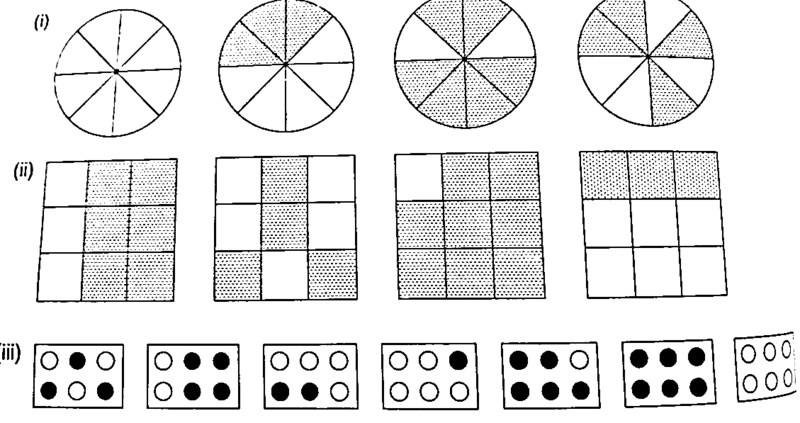 Write and indicate how you solved them. i) Is 5/9 equal to 4/5? ii) Is 9/16 equal to 5/9? iii) Is 4/5 equal to 16/20? iv) Is 1/15 equal to 4/30?